Hi all, today was a good day, Mom got back to her apartment in Coral Oaks. We met with the staff on the assisted living section and started to orient Mom to her new digs. Needless to say she was a bit overwhelmed. She will fit in very well. Most of the staff know her from her two year stay on the independent living side and welcomed her back. Some of her friends stopped by to say hello and chat. 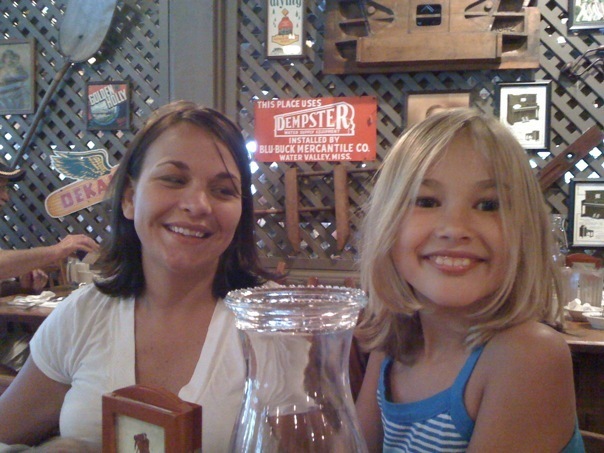 When we left she was sitting at dinner with her new table-mates and seemed to be enjoying herself. Keep on rolling, we will! Too much going on....too little time to write. So here is a quick synopsis outline of where things are! Living room slide awning is FIXED!! We've only been trying to get this taken care of since last October? Phew!!! 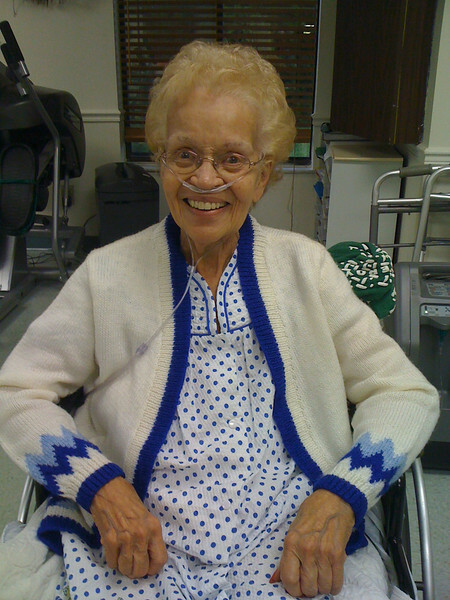 Mom-Mom is set to move to her assisted living apartment tomorrow. HOORAY! 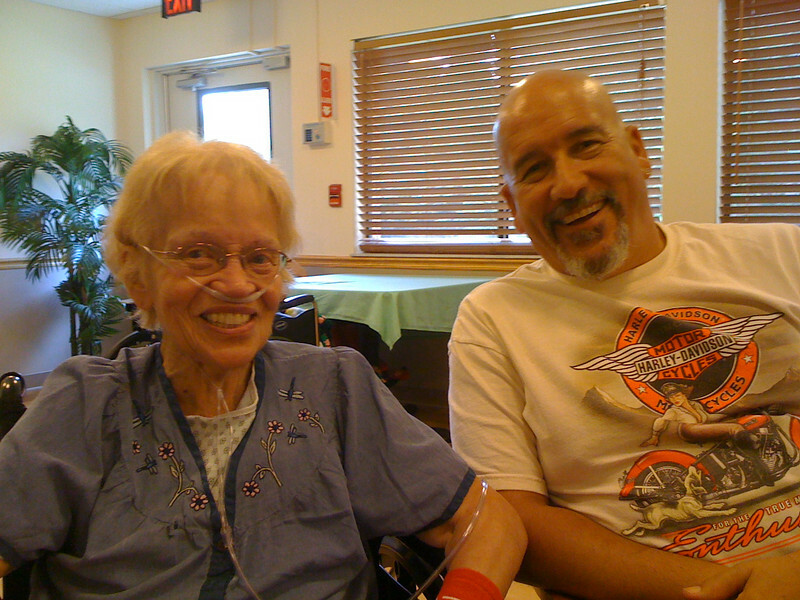 This Friday Mom-Mom has an appointment with the surgeon that did her biopsy. We will get the results of her test. We were lucky that our campground management let us move from weekly to monthly with a full credit for what we had paid. Saved us $115 and added 3 more days. Now paid through August 7th. Don't know if we will head north that quick but if all goes well then YES! Very little bicycle riding done, more on the trike....what a surprise.....NOT! I have managed to strain my lower back...good old osteoarthritis, degenerative disc disease & bone spurs. Nothing new...just had to stop the Wii Fit for a couple days, apply lots of moist heat and take my Aleve. Hoping to get back into things in another day or two. We have been finding coupons for buy 1 get 1 free meals. Seems a popular thing with the down economy. Lets us eat out for less and thus enjoy it more. Tonight is fajitas at Cody's Roadhouse. YUM! We can't wait to get to the Smokies for a respite for all this STUFF in our lives. Looking forward to some awesome riding that we didn't get to do the last time there. See, not much going on in our boring lives....but wanted to keep everyone in the loop! Remember, LIFE IS GOOD!!! There may be some relief soon. We just keep on keepin' on. Mom is back in the rehab center and getting back to her previous level. Still some work for her to get back on the feet. The doctor thinks she should be able to get to her new assisted living apartment this week. Her 4 days back at the hospital set her back a bit. Still do not know why the blood sugar took a dive, hopefully some more information on that this week. We are trying to cope with the hot weather here in central Florida. We take advantage of the few cooler days and get on the trike and just ride. This past Saturday was one of those cooler days. We went to a local bike night at a place called Biff Burgers. The place was packed, plenty of bikes, some vendors, a band that looked as if they got stuck in the '70s, beer and good food. The place has an interesting history. They used to be a franchise up and down the east coast. With increasing competition and other interests by the parent company, the franchise died off with the St. Pete restaurant being the last one standing. There's a great history tab on their web site. The first Friday night of the month is a Classic Car Cruise in. We hope to "cruise in" as well. Donna had her first practice ride on the new trike. She still needs to build up her strength for the clutch, but it was a good first outing. She said it was really different from two wheels, she had to fight her old instinct to counter steer on the turns. She'll get it, I have no doubt. We have enough miles to satisfy the break-in and I am really starting to feel very comfortable with this machine. Some things are still very tight but seem to be loosening with each ride or the bike is getting used to me. Either way I am very pleased with the way things are going. 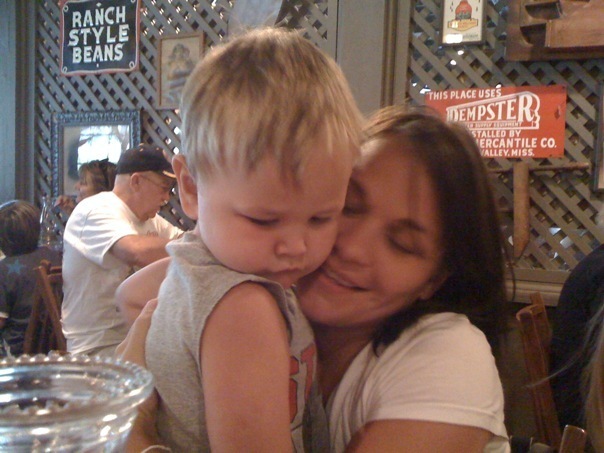 We still plan on being in the Smoky Mountains for the remainder of August after Mom gets settled in her new "crib". Then September in New England. Looking forward to some cooler climates. We visited Mom-Mom yesterday and she was greatly improved. She was still on the Dextrose but at a lower dosage level and while we were there her blood sugar checks were decreased from every two hours to every four. When we left on Friday night they were doing them every 30 minutes. Still no idea what precipitated this episode/event. She has consults this week with an endocrinologist as well as a surgeon who will biopsy the lump on her chest. It was great to see her much more her old self...she was upset that she was going to miss our party. Hmmmm? We figured out that was her current euphemism for her moving to Coral Oaks....for some reason she thought we were hosting a party. Oh well, it all works out...LOL! On a more personal note, we finally have the Wii hooked up and have been trying to do our Wii Fit every morning. It amazes me how stiff and inflexible I have gotten since we stopped using it about 2 months ago. We feel good when we use it so it's now back into our daily morning routine. We also had bought two folding bicycles at Camping World but haven't been where we could really use them (and if we were, there wasn't time). They were on sale for $149 each so I knew when I sold my Trek Navigator, they would about be paid for. Stu finally dug them out of the back of the truck yesterday and we took about a 20-30 minute ride around this big park we are staying in. We're going to try to do that nightly now, as long as it's not pouring. We just have to balance our motorycle evenings with our bicycle evenings....LOL! Boy, can we attest to that! Stu just posted that Mom was doing well...ready to move to assisted living in a week. The next morning we get a call from the rehab center, the ambulance is taking her to the ER. Her blood pressure and pulse were raised and her pupils were pinpoint. We headed to the hospital quickly. Turns out her blood sugar was in the 20's but by the time she arrived at the ER it was 212, according to the paramedics who had given her dextrose. The nurse felt she would be discharged before the day was out. We weren't sure since she still wasn't back to the norm we knew. Well, we hadn't been there 20 minutes and it had dropped to 19....scared the pants off us. She couldn't talk, barely could breath, didn't recognize us or even really respond to our voices and her eye were bugged out huge. The nurse immediately grabbed a doctor. Another shot of dextrose and then more added to her IV drip. A lot of tests ordered...blood work, chest x-ray, CAT scan. As of last evening there was nothing definitive. She was waiting for a room in ICU. Stu talked to the ICU doctor and if there had been no medication error (which is always a cause for concern) then it could be a late reaction to the heart attack (more blood work might help tell that), an unknown infection (they gave her a huge dose of IV antibiotics just in case), a recurrence of her breast cancer (she had an appointment set on Monday to see a surgeon to biopsy a lump - will know get it looked at while she's in the hospital) or something unknown. We got a call this morning and she is now in ICU so we are headed off to Bay Tree to pick up her glasses and visit. Hoping we will have more news today. When we left they were having to keep the IV dextrose running or her sugar continued to drop. Mom is almost 91 years old and has survived a lot....if it is her time then we can only hope it's pain free and peaceful. Blogs will continue to be sporadic....thank you all for your loving & caring thoughts and messages. They are appreciated. Well, good news today. My Mom got her walking papers today. The Doctor visited today and she will be discharged to her new assisted living apartment on the 23rd. Until then she will continue her physical therapy and administering her usual fussing to the staff. She cracks me up with some of her comments. The staff laughs and takes it in stride. If you ever need this level of service Bay Tree Rehabilitation & Nursing Center is a top-notch place to be. Coral Oaks independant and assisted living is another terrific place for seniors. Both places have shown compassion, professionalism and first class environments for Mom. We were blessed to find them. 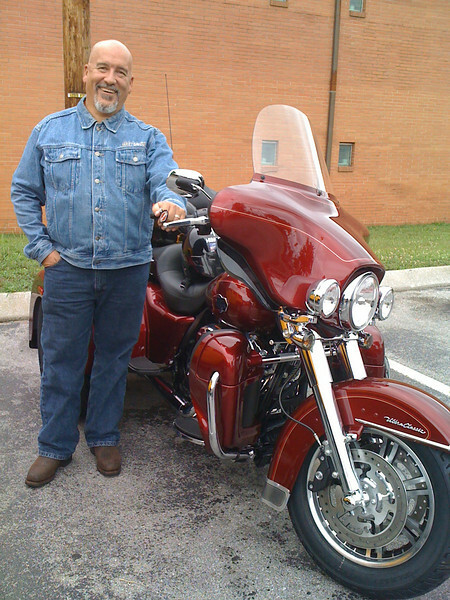 On the motorcycle front, we continue to "break-in" the new Tri-glide. Not such an easy task in the the temperature and humidity in close 100 everyday. 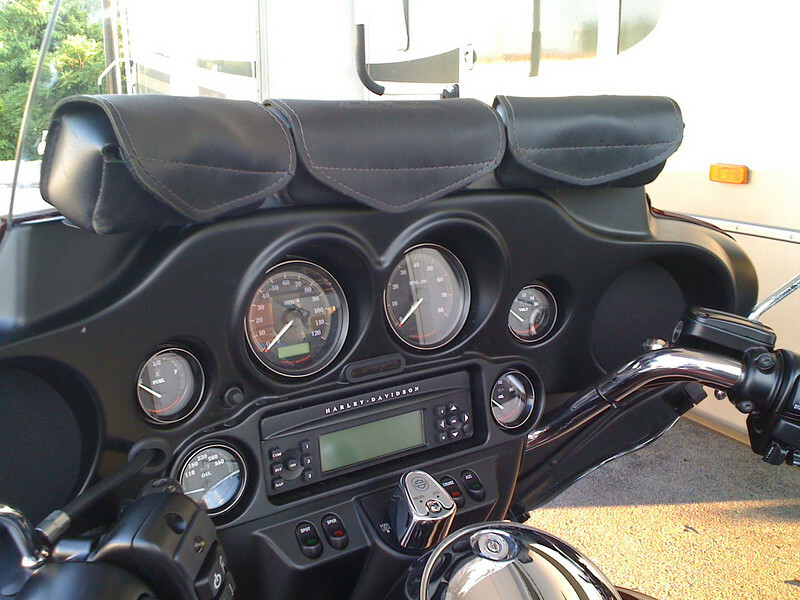 We have about 400+ miles and we do enjoy the riding in spite of the heat. When Mom gets settled in her new digs we will head to the cool East Tennessee area for some decompressing in the Smokies. Then on the the Northeast. Really not much new to post. We have been trying to get out on the bike every day, burning up those pesky break-in miles. Stu loves the bike, hates the 3000 rpm limit on the break-in miles. LOL! We're thinking about running over to the east coast of Florida this weekend, spending a night and trying to get the mileage up. The folks from Canada that bought my motorhome out in Colorado made it okay. Things seem to be going well for them and they are enjoying the rig. Makes me happy to know that someone who will appreciate her bought the Lilypad. I hope she gives them many happy miles of travel! Stu's mom is slated to move to the assisted living facility on the 23rd if nothing changes. She can do a little motoring with the walker and they want to get her to do more. She is becoming a little too dependent on the wheelchair...I think if I were almost 91 and recovering from a heart attack, I'd do the same. LOL! She is doing better, no oxygen, meds seem to have everything under control, appetite is up (gained 2# this week) and still the social butterfly. 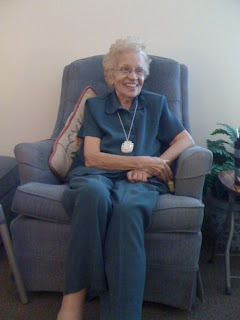 She is settling into a "new" normal at Bay Tree and we know that will have to rebuild when she goes back to Coral Oaks. So it looks like we'll be here until August....time will tell. We've modified our travel plans a bit due to the extended time here. Our tentative plans call for a week in the north Georgia mountains (at least a long weekend), then off to the Smokies for a couple of weeks. I have a big motorcycle event in Roanoke, VA the end of August so we'll do New England during the month of September (and a little of the Adirondacks as well) and maybe some of October. I know there was something else I planned to put in here but for the life of me, can't remember. So guess this is it....time to RIDE! Oops, just remembered...sold my Trek bicycle yesterday through the local Craigslist. Glad to find a new owner for it and for a little extra in the pocket. Yup, sometimes there just seems to be too much life and communication outbound seems to fall by the wayside. I am weeks behind in email replies as well as blog reading. Figured I should at least toss out a quick blog update! Stu's mom continued to improve physically and we got her hair done. This seemed to lift her spirits and we noticed she was starting to put on her makeup as well. She was walking about 100 ft with a walker and on Thursday they took her off her oxygen. Not bad for almost 91 years old! 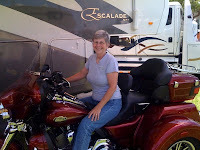 We did head out last Friday from our campground in Port Richey, FL to Cookeville, TN where our new 2009 Harley-Davidson Tri-Glide was waiting for us. We took our time heading north since we were dealing with some rain as well as July 4th holiday weekend traffic. We got a late start and spent the first night in Lake City, FL at the same campground we had stayed in on our way south, Oak 'n Pines. Good Passport America price, level site and long enough for us...oh, and great satellite reception. LOL! 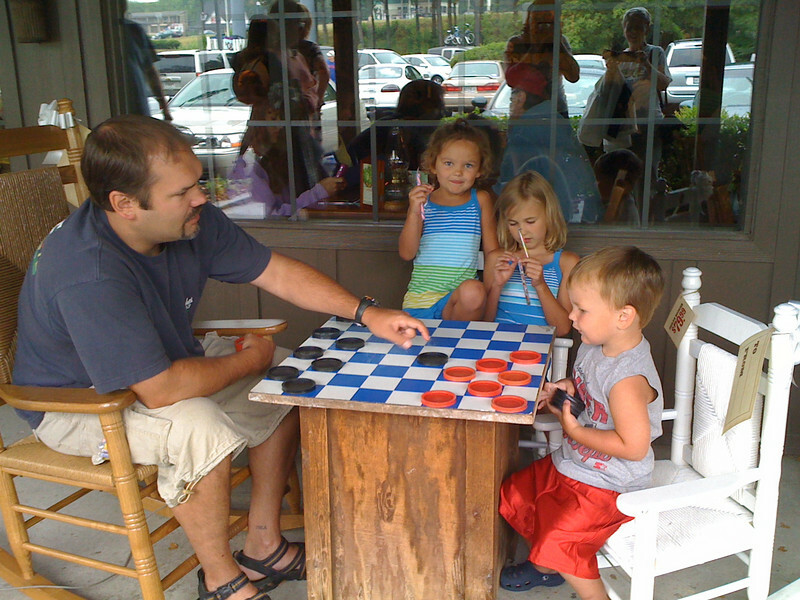 The next stop served a dual purpose...it was a good midway point, we had stayed there before, we could still get a reservation (July 4th) and it let us meet up with my youngest daughter and her family for a great Cracker Barrel breakfast! We had originally planned a weekend outing in Chattanooga with them but our unexpected trip to Florida changed that. It was great to see them all and we still hope to do a camping weekend with them on our way north when we finally leave here. 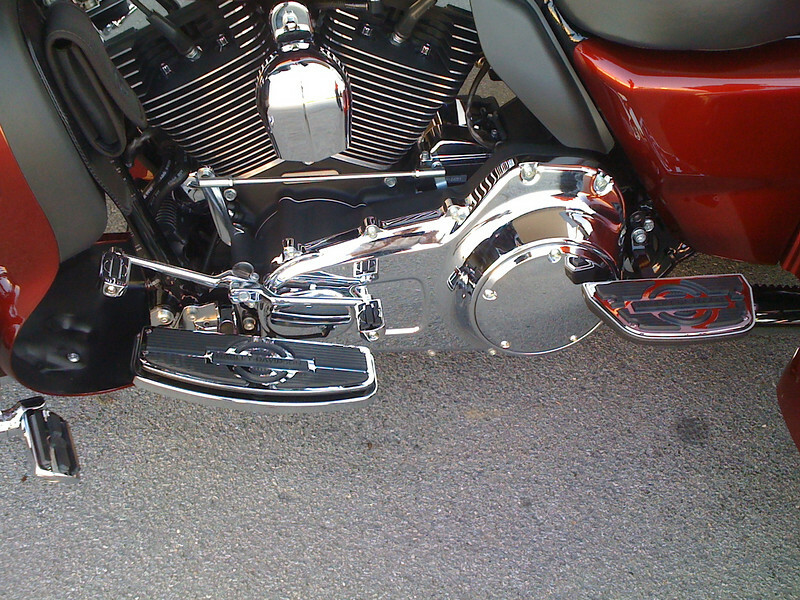 From Canton, GA we headed north to Cookeville where we had permission to asphalt park at Boswell's Harley-Davidson. We arrived in the rain late Sunday afternoon and opted to grab a movie on the way in (Transformers 2). We parked and tried to sleep, waiting for the dealer to open on Monday morning. Because Cookeville is in Central Time Zone and because Stu couldn't sleep, the first thing done on Monday was to unload Big Red and remove any accessories that we could either transfer to Big Red 2 or sell on eBay. Next we took a look, our first, at our new trike. WOW!!! Talk about gorgeous...and loaded. Kind of took Stu back figuring out all the new controls....cruise control, radio/CB, security system and lots more. 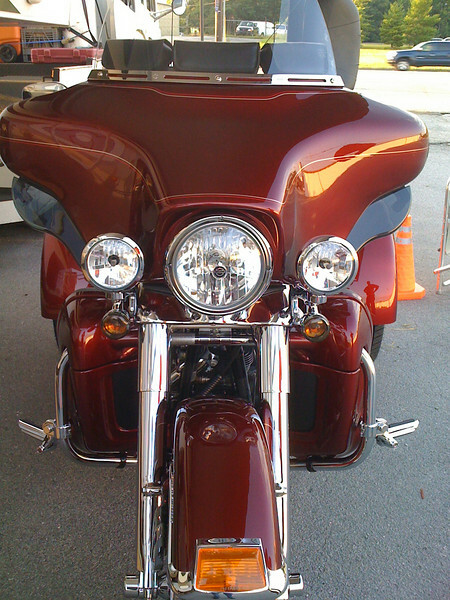 We finished up the paperwork, turned over Big Red's keys and headed out for a ride. We still needed to visit my bank to change my name and add Stu to the account so that was next on the list. Since we were across the street from my old office, we stopped in to show off the bike to my former boss. From there it was time to grab some lunch and then make a stop at the local Social Security office to finalize my age 62 "official" retirement paperwork. We headed back to the dealer to pick out the first round of accessories and needless to say, Stu wanted to start putting things on right away. I took a nap (hee-hee) while he lovingly slaved away on the bike. 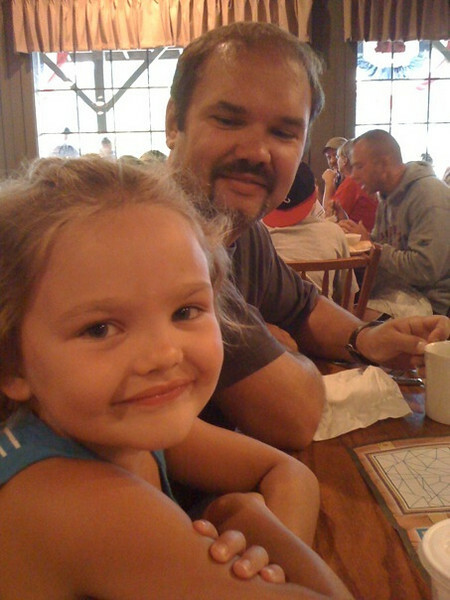 Finally at a good stopping point, we geared up and headed out for a nice 60 mile ride, capped off with coffee and strawberry shortcake at Cracker Barrel (okay, no cracks.....LOL). We spent one more night parked at the dealer's, got a few accessories mounted early Tuesday morning and then headed south, back to Florida. Can you say rain? Sigh...not looking good for much riding, at least for another week. Our routine is pretty set now. We get up, have breakfast, check the critical things online then head to the rehab center to visit Stu's mom. After she eats lunch we go to lunch and then visit the assisted living facility and work on getting her new apartment ready for her. From there we go back to visit till after dinner when we return home to collapse. The only variation is running errands in between times. LOL! Stu's brother and two of his nieces visited for two days and were a HUGE help in getting everything moved from the old apartment to the new one. Things are shaping up now but we still have to visit to pick up her mail until the mail forwarding kicks in. Mom is physically improving much faster than we all anticipated and we hope to get her moved to her new apartment in two more weeks (or so). We'll stick around another week or so to be sure she's settling in and adjusting. In the meantime we are investigating moving her to a facility in Maryland where she can be close to family. 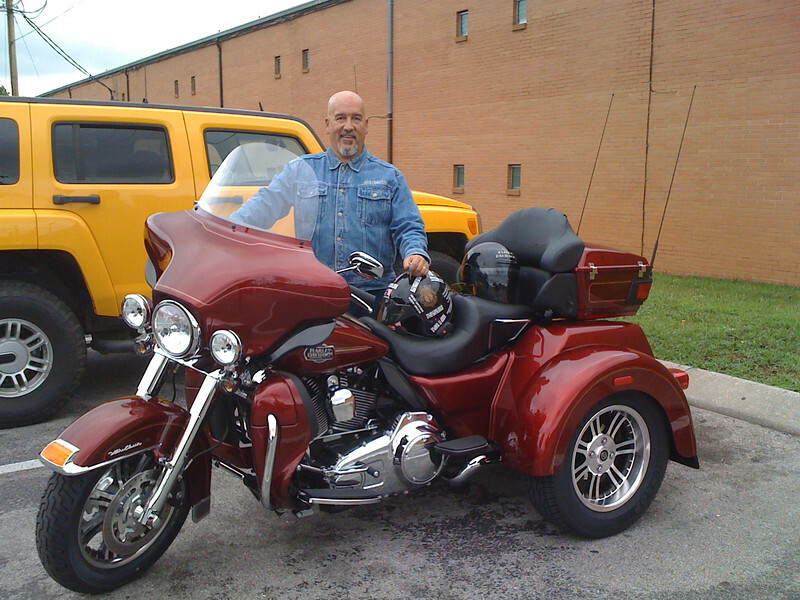 We hope to make a VERY quick trip up to TN this weekend to pick up the trike. The weather has been terrible here in Florida, rain every day. There was some pretty good flooding in the town we are in but not in the campground. We have found one a little closer to where mom is so plan to check into there when we return from TN. We are also trying to get a long-needed-fixed living room slide awning taken care of as well as our new-need-to-be-fixed bedroom A/C that is not running properly.